Ack! How could this happen? The farming season has just begun and already I’m six weeks behind schedule! Well, maybe not a whole six weeks, though it sure feels like it. But then, it always feels like this in the spring. There’s the excitement of starting anew. I love the look of freshly tilled soil, weed-free straight beds ready for transplanting. The purr of the tractor. The contrast of greenhouse work best done in shirt sleeves, and field work that is best done with hat, gloves, heavy coat and winter boots. Winter was the time for careful planning to reduce weed and critter pressure during the season, maximize yields, and possibly, just possibly, shorten some of those 14 hour days to 10 hours days, and turn seven day work weeks into six days. Now it’s time for these plans to be put into action. 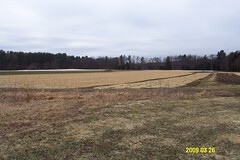 Manure spread, fields chisel plowed, beds made and planted, finishing touches on equipment repair and carpentry projects. This year I’ve been hired to be the Field Manager at Brookwood Community Farm in Milton and Canton. I’ve finished my first two weeks on the job and I am just delighted – I mean, really delighted – to be farming at Brookwood this season. I’ll post photos and stories of Brookwood soon. First though, I really should report on the Winter CSA that I’m managing this season. Yes, I know, spring has just arrived and it seems early to be thinking about how we will feed ourselves this winter. Well, it seems early unless you’re the farmer responsible growing the food. Picadilly Farm and Riverland Farm are the primary growers for the multi-farm Winter CSA this year. The farmers report that their season is off to a great start. Farm crews have settled in and are working hard in greenhouses and the fields. Here are some photos I took on a visit to Picadilly and Riverland last month. Jenny, Beckley and I drove down to Sunderland to visit Rob and Meghan at Riverland. What a sweet little farm these folks have! 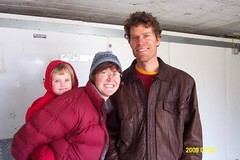 They built a much needed greenhouse this past winter — do check out the nice slide show posted on their web site. 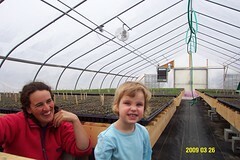 Here are photos of Meghan and Beckley in the new greenhouse, onions for the winter share in the background, and the Riverland Farm apprentices on their first day of work. I'm so glad you found a place!